Coedo Shiro is a hefeweizen style beer that is advertised as a premium all malt beer. It is also one of the hardest beers to find from the Coedo range as Coedo Shiro is unfiltered and stores are hesitant to sell it. In 2014, the bottle was redesigned and now advertises that it is a hefeweizen on the label. I found it! I found it! Finally after months of searching. Coedo Shiro poured out super cloudy but that was to be expected really. It’s a hefeweizen. I can imagine people screaming “what is this? Why does my beer have bloody stuff in it?” if I were there when the moons aligned allowing people to buy this beer, get it home, and drink it that day. It isn’t the strongest hefeweizen we’ve had on BeerTengoku, but Coedo Shiro does smell like banana and cloves. There was a little bit of wheat to the nose as well which was balanced with the other aromas. Coedo Shiro is a little stronger in the body; perhaps it’s from the higher levels of carbonation than I expected that brought it to the front. For some reason though, this is a hefeweizen I can get behind. None of the flavours really dictate the direction of the beer and they seem to compliment each other well. Coedo Shiro finishes off with a slight nod to IPAs with a citrus, almost grapefruit-like, aftertaste to it. 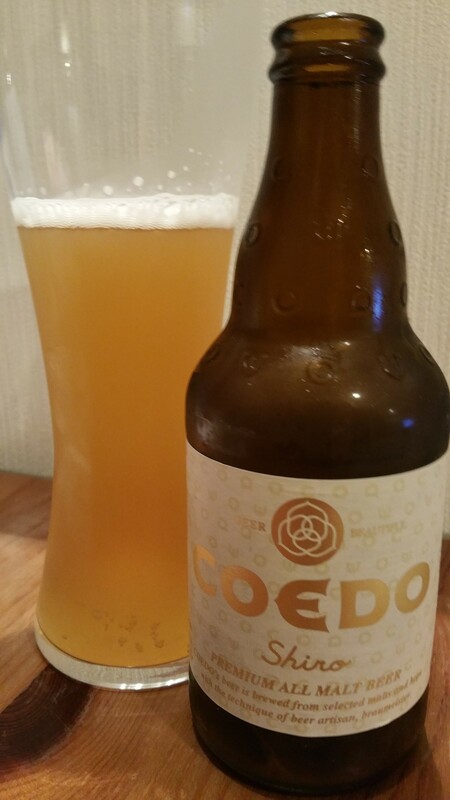 Coedo Shiro is a hefeweizen that I can actually recommend and would happily drink again. Coedo Shiro can be bought at Queens Isetan and other major department stores are known to stock it. However, it’s a bit harder to find in smaller independent retailers. Coedo Shiro can also be found on tap at these places here.